The Brookings Institution ranked St. Mary’s University 17th among the nation’s four-year universities for its contribution to the financial success of its graduates mid-career. The ranking places St. Mary’s tied for first among all private and public institutions in Texas and in the same league as MIT, Stanford, and Rice University. St. Mary’s is the first Catholic university in Texas and the Southwest. With a diverse student population of nearly 4,000, St. Mary’s integrates the liberal arts with professional education and prepares graduates for exceptional leadership. Students study within the School of Science, Engineering, and Technology; the Greehey School of Business; and the School of Humanities and Social Sciences. There are numerous options for graduate-level studies, and St. Mary’s is home to San Antonio’s only law school. The School of Science, Engineering, and Technology (SET) provides a vibrant, challenging, and supportive environment that prepares the next generation of experienced researchers, skilled engineers, and scientists to become engaged citizens of the world. SET students are part of a community that is committed to their intellectual and social development. St. Mary’s award-winning professors are dedicated and caring teachers whose doors are always open. They are energetic researchers who mentor and work with students in well-equipped laboratories. They are involved in community outreach activities that give students an opportunity to participate and apply their STEM education in service to mankind. With the guidance of faculty, students craft their own success stories. Faculty educate students to view problems not only as having only scientific solutions but moral and ethical considerations as well. Students are made aware of the inter-relatedness of all disciplines and the importance of each. By integrating a liberal arts education that is grounded in the Marianist tradition with a comprehensive and balanced STEM curricula, St. Mary’s prepares students for success not only in their professional careers but in all aspects of their lives. The Honors Program offers an academically challenging and personally enriching course of study designed to cultivate critical analysis, clear oral and written expression, aesthetic awareness, and ethical judgment. Internships in the summer or during the semester give students a notable advantage as they prepare for their future careers. 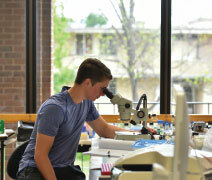 Students at St. Mary’s are encouraged to participate in undergraduate research. They conduct progressive research using critically emerging technology in fields such as bioengineering and biology. St. Mary’s promotes a campus culture of service and change in the community. Students who live on campus become a part of more than just the campus community, as organizations offer academic, political, cultural, social, and community service activities. Students also participate in 80 University-sponsored clubs and organizations or in programs such as ROTC, the Ethics Bowl, and Coffee and Politics. With an average temperature of 68 degrees, San Antonio, the seventh-largest city in the United States, is consistently warm and an ideal location for outdoor recreation. Students will find professional sports, numerous art museums and galleries, concert venues, theater and dance groups, amusement parks, and malls and outlets. The nearby Hill Country has clear, cool rivers for tubing and rafting, and the Travel Channel ranks South Padre Island among the best spots for spring break. Come for a visit. Stay for four life-changing years.